The Republic 2 shelf clip bears a similar design to the Republic 1 shelf clip. This clips is shorter in length, and has two tabs. To see exact dimensions, you can reference the photos above. 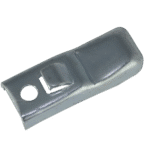 The clip is also functionally similar, with each tab locking into the corresponding slot, and the angled top portion allowing the edge of the shelf to sit firmly in place. 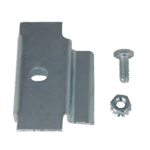 Along with Lyon and Hallowell’s shelf clips, the Republic Shelving Shelf Clip 2 ranks high among our most popular models. To order these clips, we encourage you to utilize our quick and simple online ordering process, or give us a call at 855-289-2547.